After you call three to four local roofing companies, the real work of sorting through the confusion starts, mainly figuring out: Why are all the roof replacement estimates priced so differently? There are many factors that affect the decision-making process for selecting your roofing contractor, such as reputation, license and insurance. However, the scope of work, materials used, bid details and cost to complete the project are ultimately the most important factors. How does a roofing company price a new roof? What are the variables to consider? The roof’s pitch is an important factor in determining roof cost for two reasons. First, a very steep roof, typically recognized as anything that’s more than over 6:12 pitch, is generally considered not walkable and requires greater staging, safety and labor to complete the roof properly. Second, depending on the type of roof being installed and the required fire rating, roof pitch determines the type of required underlayment system and thus plays a very important role in pricing a job properly. For example, a composition shingle roof that is between 2:12 and 4:12 pitch requires two layers of underlayment installed, while a flat roof that is between a 1/2:12 and 2:12 pitch may require certain underlayments to achieve a Class A fire rating. For the most part, roof tear-offs are determined by the amount of time it takes to remove – the labor - and the dump charges to dispose of the material, which is typically determined by the weight of the material. The heavier the material or the more there is, the longer it takes to remove the old roof and the more it costs to dispose of. There are sizeable differences between types of roofing materials. The price of the roofing product being used plays a direct role in the aesthetic design, weight, durability and ultimate longevity of the new roofing system. For sloped roofing products, asphalt composition shingles tend to be your entry level product, with dimensional lifetime shingle products options demanding an increased price. 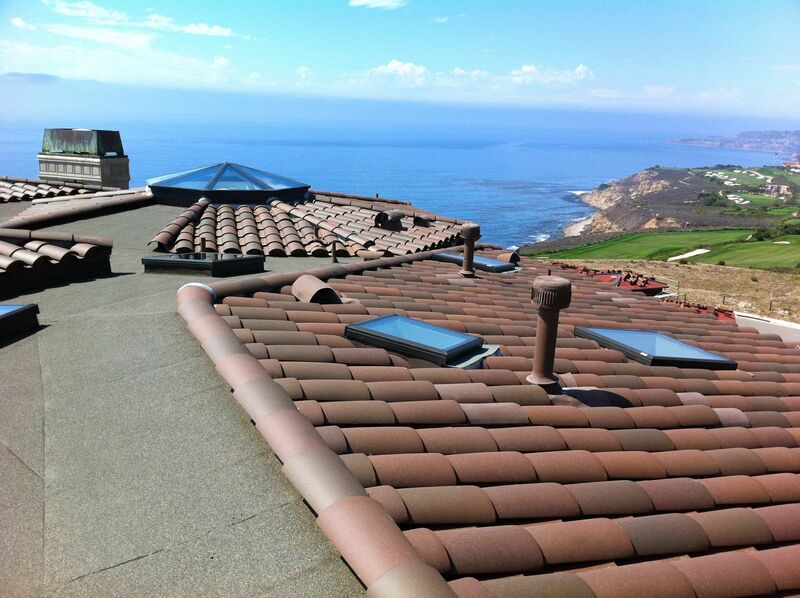 Concrete and clay tile tend to be more of a mid-range option with synthetic, wood shake, metal roofing and traditional slate being in the higher range roofing products. For flat roofs, pricing options tend to start with coatings, hot-mop built-up roofs, modified torches, TPO products and finally single-ply PVC systems. Most people think of their new roof simply as the new tile or shingle which is being applied, however, there is much more to waterproofing your roof over the long-term. The type of underlayment and decking materials being used, the ventilation and insulation being installed and even the types of fasteners be applied all carry a different level of performance, longevity, manufacturing cost and thus price. Access to the roof is a critical aspect in the overall pricing of the job. Difficult access means additional equipment costs of labor are necessary to tear-off the roof, load the roof, stage the roof and complete the roof. Since there is a direct correlation of labor and equipment costs to every roofing project, the easier the access, the less time and material is necessary to complete the job. There is a significant difference between a standard roofing warranty, where the roofing contractor is backing the labor and workmanship of the project, versus an extended or no-dollar-limit (NDL) warranty backed by the manufacturer themselves. A manufacturer’s warranty typically requires additional steps, materials and inspections along with a fee that is charged by the manufacturer to back and support the roofer’s labor and workmanship. A standard roofing warranty typically does not require the extra steps, however you pay for what you get and should consider this difference when looking at bid comparisons. Manufacturer-warranted roofing replacements typically feature higher quality workmanship, since they bring an added set of eyes on the inspection and ultimately more security and peace of mind to the consumer. Finally, there are finish details and prep details that absolutely affect the cost of the job. For instance, the type and quality of the lumber being used for fascia and rafters, along with the finishing sealants and counter flashing details all play a critical role in not only the look of your finished roof, but the cost you will pay.